We all love pesto with pasta, but have you tried it with chicken and potatoes? It’s a match made in heaven. Roast it with veg for an easy one-dish dinner. 1. Heat oven to 200°C, Gas 6. 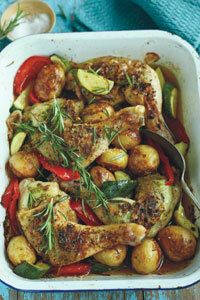 Take a very large roasting tin and tip in the potatoes, courgettes, pepper and garlic. Sprinkle with sea salt. 2. Pour in the stock and drizzle over 1tbsp olive oil. 3. Spread the pesto between the chicken flesh and skin and arrange on top of the vegetables in the tin. 4. Sprinkle over the chicken seasoning and rosemary sprigs, and drizzle with the remaining oil. Roast for 20 mins, turn over the vegetables and roast for 20 mins more until the chicken is cooked through and the potatoes tender and golden.